• Oregon State has not reached out to UCLA offensive coordinator and interim coach Jedd Fisch about its head coaching vacancy, as ESPN reported Monday. Fisch is not being considered for the OSU job. Beaver officials have interviewed several others for the position, including California O-coordinator Beau Baldwin, Washington O-coordinator Jonathan Smith and current interim coach Cory Hall. One source says Mike Bloomgren, Stanford's O-coodinator, also has been interviewed. Athletic director Scott Barnes and school president Ed Ray are waiting to speak to at least two head coaches — one of a Power Five program — before reaching a final decision. I expect the hiring to be made by Dec. 3, well in advance of the Dec. 20 letter-of-intent signing date. And it could come before that. The leaders in the clubhouse are Baldwin and Smith, not necessarily in that order. I hear Smith made a very strong impression during his interview. • Oregon State's early-season baseball schedule in 2018 features eight games in Surprise, Arizona, from Feb. 16-25, and a three-game series at home against perennial power Cal State Fullerton, March 9-11 at Goss Stadium. A year ago, the Beavers beat the Titans 6-5 in their opener at the College World Series. Should be a fun series. Corvallis can be lovely for baseball in early March. OSU opens the Pac-12 slate at California, March 16-18. The conference home-opening series is against Washington, March 23-25. • It's hard to be humble these days if you're an Oregon recruiter. The Ducks are ranked No. 1 nationally by Scout.com in football recruiting for 2018, with 15 four-star athletes in a stocked-full class of 24. Trailing on Scout's list: Ohio State, Texas, Penn State and Miami. Oregon is ranked sixth by Rivals.com and 24/7 Sports. In basketball, the verbal commitment by 7-1 1/2, 215-pound center Bol Bol — son of the late Manute Bol — from Findlay Prep in Henderson, Nevada, has propelled the Ducks' 2018 class into the No. 1 spot nationally by 24/7 Sports. Behind Oregon: Kansas, Duke, Kentucky and North Carolina. That's pretty good company. Scout has Bol ranked as the No. 2 recruit in the country; 24/7 Sports and Rivals have him at No. 3. All three services rate another Duck commit — 6-7 forward Louis King from Columbus, New Jersey — among the top 25 recruits nationally. • Bol provided insight into his decision in a recent first-person account on the Players' Tribune website. He said it came down to Oregon and Kentucky, choosing the U of O though he'd rooted for the Wildcats growing up. Bol credited UO assistant coach Tony Stubblefield with getting him interested in the Ducks. He said the Oregon coaches understand his style — "I like to work from the perimeter" — and that head coach Dana Altman said he "doesn't expect me to gain more weight than is actually possible. It was one of those little things he said that made me feel like … he got me." On Bol's visit to Eugene, he was taken into the Phil Knight Room, "where they showcase all the new Oregon gear Nike is working on. What I saw in there blew me away. Shoes lined up on chairs. Custom Oregon colorway Jordans. Like 13 different jersey combinations. Nike stuff that hasn't come out yet. Those Jordan 4 Oregon retros that LeBron was wearing recently … I was just going crazy in there, man. For a kid obsessed with shoes, that was like heaven." Also: "The last thing I loved about Oregon was that the university has one of the biggest social media bands in college sports … I loved that Oregon and the athletic program want to have their own style and identity. I feel the same way." 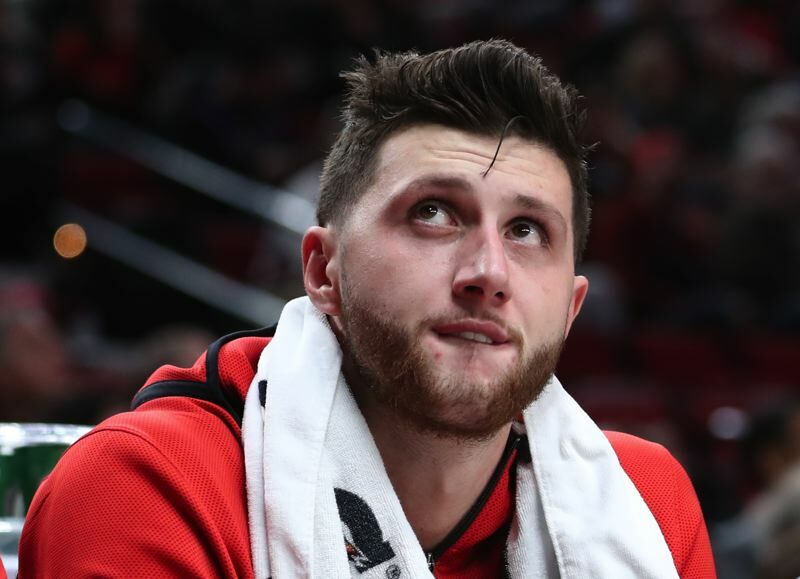 • Nice article by Portland native Ben Golliver of SI.com on Jusuf Nurkic, going into detail about the disdain the Trail Blazers' "Bosnian Beast" holds for his former employer, the Denver Nuggets, and coach Mike Malone. The Nuggets sent Nurkic and a first-round draft pick to Portland for center Mason Plumlee, a second-round choice and cash last February after Nurkic was beaten out for the starting center job by Serbian Nikola Jokic. The summer before the 2016-17 season, "Mike Malone came to me with all this sweet talk, saying that I was going to be fine and that he couldn't wait to see me back," Nurkic tells Golliver. "If you like somebody else, play them. But don't come to my home and say I'm going to be the starting center and then play someone else." Nurkic twice asked the Nuggets to trade him, the second time last December. After that, Nurkic was viewed as a malcontent. He said he and Malone went months without directly communicating, and he played sparingly in his final weeks as a Nugget, experiencing six DNP-CD's (did not play/coach's decision). Before the Blazers' 101-97 victory over the Nuggets on Nov. 13, I asked Malone if he sees a different player in Nurkic than the one that played for him in Denver. "I see a hell of a player who helped them make the playoffs last year," Malone responded tersely. "I wish him nothing but the best." • When the Philadelphia 76ers visit Moda Center to play the Blazers on Dec. 28, remind me to go up and shake the hand of rookie Ben Simmons. The 6-10 Simmons, the leading candidate for the Rookie of the Year Award, has a stat line that says he is 0 for 7 from 3-point range. That's because Simmons has the guts to cast up a Hail Mary as the game clock nears zero at the end of a quarter. All seven of his attempts fit into that category. It's the right thing to do, of course. If even one of the howitzers falls through the net, it's worth it. But most NBA players won't take such a shot because it goes down as a missed field-goal attempt. Many of them will disguise it by launching the shot just after the buzzer sounds. One of the few players I can think of who will regularly take an end-of-the-quarter shot is Portland's Meyers Leonard, bless his heart. There's a simple solution to this. Any shot from midcourt at the end of a quarter does not count as a field-goal attempt, unless it goes in. You can't do that, you say? Why not? Of course you can. And the NBA should. We'd see a lot more buzzer-beating shots attempted — and at least a few more made. • Simmons, incidentally, is averaging 18.7 points, 9.2 rebounds and 7.6 assists while playing four positions for the Sixers, including point guard. Then there is his teammate, 7-foot center Joel Embiid, who has managed to stay healthy all season so far. Embiid — who missed his entire first two seasons after a pair of foot surgeries and played only 31 games last season — is averaging 22.3 points, 10.9 rebounds and 3.4 assists. On Nov. 15 against the Los Angeles Lakers, he went for 46 points, 15 rebounds, seven assists and seven blocked shots — the only such stat line since the NBA began recoding blocks in 1973. Embiid has sat out only two games this season for rest purposes, once on the second of back-to-back games. The Sixers will have two days off between a Christmas Day game against New York and their visit to Portland, so barring injury, he should be in the lineup against the Blazers. • I received a news release this week, saying the Little Sisters of the Poor are heading back to court to defend themselves against lawsuits by the states of California and Pennsylvania to take away religious exemption from a new Health & Human Services rule. Here I was, thinking Little Sisters were the ones who Alabama played in football last Saturday. Come to find out it was really Mercer.